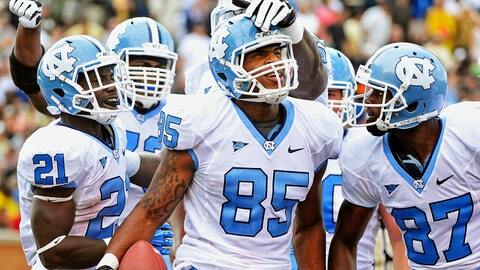 North Carolina's Eric Ebron set a single-season ACC record for a tight end with 895 receiving yards and counting. North Carolina’s pass defense isn’t all that bad statistically — 52nd in the country — but the secondary is still vulnerable to the big play, and Cincinnati has the No. 15 passing offense in the country. Brendon Kay, Cincinnati’s quarterback after Munchie Legaux went down early this season, completed nearly 69 percent of his passes for just over 260 yards a game. Both he and the Cincinnati offense were prone to turnovers from time to time, and North Carolina’s secondary has been opportunistic when it comes to getting interceptions. Between the potent Bearcat passing attack and their ability to keep drives alive via third down conversions (50 percent, which is 12th nationally), they are going to test the Tar Heel defense and their ability to stay disciplined. UNC’s third-down defense is 77th nationally and 13th in the ACC, surrendering nearly 41 percent on third down. They’re going to have to keep the Bearcats off the field and not allow big plays. Tight end Eric Ebron will be playing his final game in a Tar Heel uniform, and the Mackey Award finalist will almost certainly be a high draft pick in this year’s NFL Draft. He’s always a fun player to watch, and he’s a matchup nightmare for almost any team the Tar Heels face. Defensive backs are too small to tackle him, while linebackers or defensive ends generally can’t stay with him in coverage. But there are times the Tar Heels forget about him, and don’t target him quite enough. Teams are changing their defenses to slow Ebron, but that hasn’t always mattered. UNC’s freshmen and sophomores have scored most of the Tar Heels’ touchdowns during this winning streak, and Ebron has been relatively quiet since a hot beginning of the season. But special players tend to shine in bowl games, and if Cincinnati doesn’t have the personnel to slow him down, he could have a big one. 17.07: North Carolina leads the nation in yards per punt return (17.07), and Cincinnati is 108th nationally in net punting. The Bearcats have allowed a few long punt returns, and North Carolina’s Ryan Switzer has certainly had a few of those this year. Those kinds of plays could change this game. Both of these teams started out their respective seasons with disappointing records and results, and both faced adversity through the loss of their starting quarterbacks. Both bounced back quite nicely, and both backup quarterbacks have flourished in the starting role. Kay has been great, as discussed, and Marquise Williams has become a dual-threat quarterback for the Tar Heels that has hidden some of their offensive line issues. With the youth movement underway in Chapel Hill, there’s plenty of reason for optimism going forward with this team. Both Cincinnati and North Carolina are playing as well as any team in the country towards the end of the season (Cincinnati won six of its last seven, UNC won five of its last six), but ultimately it just feels like UNC’s young talent that is starting to flourish will win the day.